M1: [Bow] JT Baird,  Tom Watson,  Conor Burgess,  Ollie Sluijters,  Craig Lambert,  Neil Paul,  Joel Wilson, [Stroke] Paddy Buchanan, [Cox] Will Miller, [Coach] Chris Smith, [Boat] Adrian Cadbury. M2: [Bow] Ryan Davey,  Tom Waszkowycz,  Conor Bacon,  Jasper Montana,  Ed Bentley,  Raphael Scheps,  Kittiphat ‘Am’ Chanthong, [Stroke] Kert Putsepp, [Cox] Louis Shankar, [Coach] Chris Braithwaite, [Boat] Vicky Wade. M3: [Bow] Filip Gokstorp,  Oisin Huhn,  Stefan Weetman,  Jeremy Wong,  Richard Bethlehem / Roger Wiederkehr,  Philipp Heckmann-Umhau,  Ash Simkins, [Stroke] Mark Pozlep, [Cox] Neha Vaidya, [Coach] Will Miller, Conor Burgess and Paddy Buchanan, [Boat] The Lady Jo’anna. 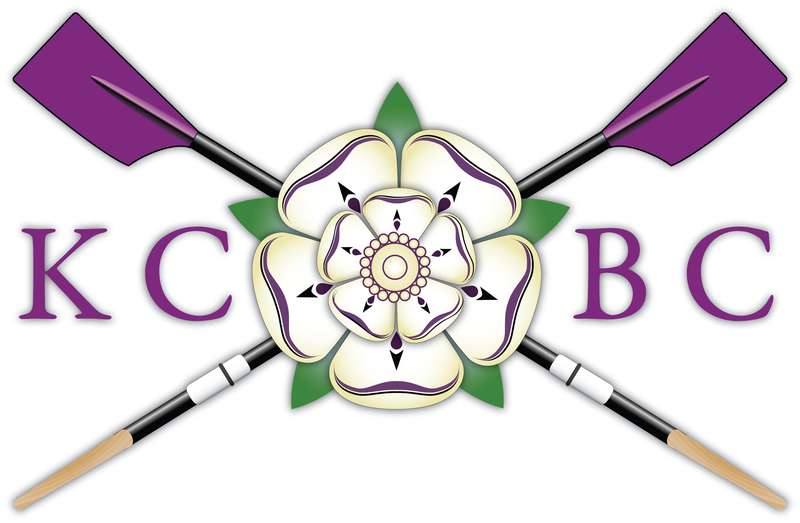 W2: [Bow] Helena Sivaloganathan,  Vanessa Tyler,  Erin Lam,  Antoanela Siminiuc,  Krysia Waterhouse,  Georgia Kirby,  Saki Shinoda, [Stroke] Isabel Barnes, [Cox] Emily West, [Coach] John Aspden, [Boat] Jolly Roger. On the last day, our struggle to bump Queens continued. On the way down the lock we the boat was sat and spirits were high. The practice starts were decent and the rate was low but controlled. As yesterday, as soon as we pulled in, the 4 minute cannon sounded. Right let’s get our heads in the boat… The plan was simple we were to go hard off the start, putting as much pressure in the water as we could. One minute cannon, we were ready for this…. We underestimated Queens yesterday and this was not happening again. Cannon! We were off… However, with a shaky start we didn’t get the early whistles we had hoped for, and had to go for the long race. As we came around the second corner we were still between stations and one whistle. Stroke caught a crab and as a result we fell behind to two lengths but Jesus V had been bumped behind us, so it was just us and Queen’s IV. As we got to the reach we raised our spirits and managed to gain back to a station apart. Unfortunately Queen’s also mustered their spirit and managed to keep their distance. In the end we finished with a comfortable row-over to solidify our dominance over Jesus and high spirits as we maintained our position for next year. The final day of Bumps would be a difficult one. At the back of Division 3, we had the formidable Clare Hall in front of us (again…) and Jesus bringing up the rear, who had just bumped Clare in the previous division. A good practice start took us past the throng of people crowded at the Plough; we then flew past the KCBC marquee, where we were graced with a huge cheer. We took our place at the start and waited. With the final cannon of our May Bumps 2014 campaign, we were off. A good start took us around the first corner, keeping pace with Clare Hall. Unfortunately, Jesus were clearly gaining. The first whistle came annoyingly quickly, although subsequent blasts took longer. We held our ground and tried to force them off without losing spirit or speed. We flew past the marquee once more, where a huge cheer gave us a much-needed boost. However, by the time we had rounded First Post, Jesus’ bow was overlapping our stern. A bump was inevitable and the contact was soon felt. We slowed and pulled in at the side: we had rowed well, it was just that Jesus had rowed better. A gentle cruise back to the boathouse, which would be our last time together as a crew, soon descended into anarchy with spirits still very high. A crew photo was followed by a quick swim, voluntarily for some but begrudgingly for others. We sipped champagne as we dried on the bank and looked back on the week’s rowing: yes, we had been bumped. But we had also bumped twice, moved up one place overall to the border of the third and forth divisions and, most importantly, had fantastic fun throughout. W1 have decided to submit an interpretive video for their race report. With an extremely large, strong and most importantly fast Murray Edwards crew in front of us and a Magdalene crew on the search for vengeance behind, it was never going to be an easy day for w1. After a flying practice rolling start which appeared to appease even Roger, we felt confident. However we also knew how important it was to not underestimate magdalene. We knew our brief – tire out Murray Edwards as long as possible and potentially (with a little luck) bump back. We went off with a slightly rocky start. However even so our confidence was boosted somewhat by the presence of whistles on Murray Edwards by first post corner. We held them at a length lthrough the gut, our confidence soared as we noticed that Magdalene had fallen away to the distance. As we came through grassy we were shocked to see Magdalene W1 succumbing to Jesus W2. This spurred us on and we continued to gain slowly upon Murray Edwards. However as we rounded the final corner onto the reach we were tired and it began to show in our rowing. The boat began to crash down onto stroke side then bow side. Murray Edwards began to pull away from us. We eventually wound it down half way down the reach. Whilst we had not quite managed to match Murray Edwards this day, we rowed home buoyed up with the thought that they would be rowing again and thus entering the final day greatly fatigued. M1’s epic struggle with Clare continued today as we looked to improve on yesterday’s result of closing to around 6 feet. We knew that once again we would have to go out of the blocks like a rocket to give us the best chance of bumping. The row down felt as good as we have been moving all term, really cranking up the rate on the practice start outside the plough and moving well together. Before we knew it, we were being pushed out at the start with a simple race plan in mind – go out hard to bump by the plough. As per the plan, we went out hard, winding up to 52, really sending the finishes through cleanly. We picked up our first whistles shortly after the outflow, much like yesterday, and quickly moved to 2 whistles before closing to a canvas coming into the gut, and then gaining a few inches of overlap in the gut. This was it, time to push on to make the bump, but despite a strong lift, Clare managed to hold us off, meaning we’d have to try to hit them around grassy or on plough reach. In front, Clare had closed to a canvas on Queens’ ahead of them so were being spurred on to a bump of their own. Despite giving it absolutely everything, we couldn’t close the canvas gap they held over us and eventually we all rowed over many lengths clear of Christ’s behind to continue the form for the week. After an almost perfect race, it was gutting not to catch Clare, but we’ll be back tomorrow in an effort to end the week on a high. M2 – Rowed over at top of Div. 4, Bumped Clare in Div. 3. Day 3 would be make or break for M2 if we wanted to move up to Division 3. A comfortable row down was technically good, as was the practice start we were finally allowed, due to the absence of re-rows or equine disasters. We made our way to the front of division and the first cannon soon sounded. With the third blast, we were off with one of the best starts we’ve yet managed. Good lines took us round to the Plough, by which point Jesus had bumped Fitz, leaving only Caius (from three stations back) many lengths behind. We kept a good pace until the first stretch of the reach was done, at which point we started to relax as it had become clear Caius weren’t going to achieve an over-bump. We soon crossed the line with Caius still a decent distance behind. The first race was done, but that was the easy one. A rest at the railway bridge gave us time to recuperate and take on water, before another row down to the start – except this time right down to the lock. An uncertain practice start was soon followed by a short stretch of high-quality high-rate work leading to the motorway bridge. We span and got ready to pursue Clare, who had been bumped down by Clare Hall quite quickly the day before. After pushing off, we managed to get right to the end of the chain in time for the start, at which point we managed to pull it out of the bag and give our best start of bumps. The first whistle came surprisingly quickly, just after the corner, which spurred the crew on. Further whistles soon followed, but a minor crab caused us to lose some distance. Thankfully, we recovered and caught back up, with our ears soon graced by the sound of continuous whistling. Another crab caused minor difficulties but by this point the bow-ball had passed the cox, who slowly conceded. We had managed our second bump, and much sooner than any of us had expected. Finally, M2 were rowing once again in the third division, with only tomorrow’s single race to secure that position for next year. This was always going to be a difficult day for w1. Rowing sandwich boat again with a large, fast Murray Edwards crew chasing us, we knew we would have to row our best race or get bumped. Our start was one of our strongest yet, it even seemed that Murray Edwards was falling away as we rounded first post corner. We kept strong up to the plough, responding well to resplendent cox Phil Smith’s calls for lifts. However from here Murray Edwards began to seriously close on us. With no time to settle we were still rowing at our initial high rating and we were starting to suffer. The power and commitment was still there but we were beginning to rush the slide and this was our downfall. After an impassioned defense we were finally bumped a little way down the reach. However well we rowed that day we realised that the better crew had won, though we went home with our heads held high and our thoughts on a potential bump for tomorrow . Someone once said, ‘if you push down on the legs, then bumps glory can be yours too’… they also mentioned something about sandwiches, but more on that later. 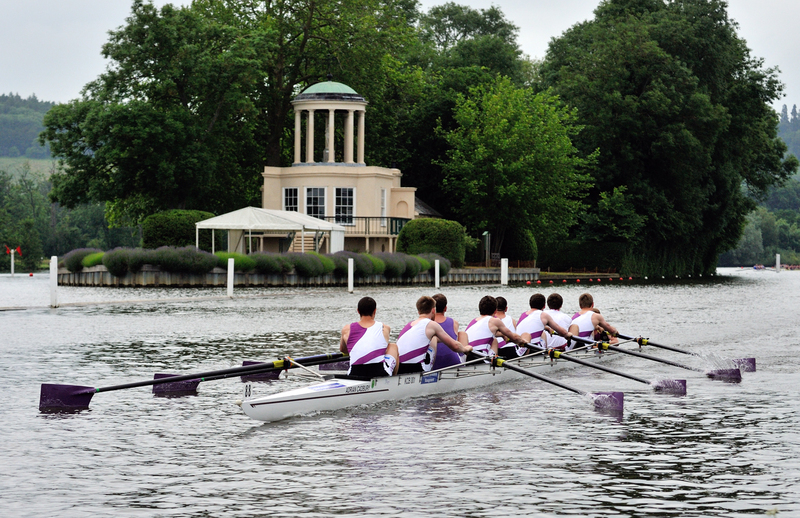 King’s M2 had emerged from the first day of bumps relatively unmoved. The straight-faced chalk drawing on the Plodge scoreboard attesting to the rowover of the preceding day. However today we faced new foe and a keen eye may have spotted the slight upturn on that chalky mouth. Sitting at position two of the fourth division, we had Fitz II in front (sent down from Division 3 by Clare Hall) and Jesus III behind. Canons bellowed, chains dropped and we kicked the boat into gear with a strong start. We had barely managed to go for a ‘rhythm 10’ before a sound broke the air, which for many of us, as bumps novices, was new and unfamiliar. One whistle. Then two. Push on. Three whistles. Jesus drifting away behind us. Push on. Continual whistling. Hold it up. Out of the way. We bumped Fitz II! Now I don’t know about you, but I always try and eat after exercise, and although that first paddle had barely brought on an appetite, it was Sandwich time for Kings M2. We now had to row again at the bottom of Division 3. After a gratuitous lap up to the P&E and back to the lock that was more reminiscent of a morning outing than preparation for a race, we pulled up and talked ‘strategy’ with John and Will: apparently the guy with his ears pierced in Clare Hall, ahead of us, might actually be a pirate. Who knew?! Pirate, or no pirate, we had faced them before and we knew we would need to go out hard. Try as we did, their ship managed to bump ahead and we ploughed on to The Plough. With the possibility of an overbump of Magdelene II out of our grasp, it was smooth sailing from there. Rowing on to a rowover, the crew showed good technical improvement and coordination over the last two days and look forward to the two ahead. Our name is King’s M1, leaders of the men’s boats of King’s College, achievers of ultimate speed on plough reach and the loyal servants of our true coach, Chris Smith. Three feet from bumping in the gut, pushed off valiantly by Clare on plough reach. And we will have our vengeance, in tomorrow’s race or the next. After the misfortune of the day before, M3 were seeking revenge on Jesus. There was an element of worry, but we knew, provided we started well, that we could get the revenge bump on them. After a shaky practice start, nerves were high but we were determined and focused on our target. Sadly it wasn’t so straight forward. Hoping for no weird events so that we could just get on with it, we met delays once again, this time due to a spooked horse which had escaped and ran along the towpath. After a long period of time and numerous countdowns waiting for the 1 minute cannon (longer than 10 minutes), the horse was returned safely and the cannon eventually sounded. We knew what we needed to do and we got off to a controlled start. Before reaching the end of our starting sequence, in the rhythms, whistles started. We were gaining on Jesus quickly. Just before 1st post corner, Jesus were running scared and crabbed meaning we went from two whistles to bump so quickly that we didn’t get the whistles in between. We’d bumped back. We’d got revenge and done it impressively: Jesus had been caught in less time than spent waiting for the “1 minute cannon.” As first bump for Kings in Mays 2014, we were ecstatic. Spirits high, we are ready for what the third day has to bring. In what must be one of the most uneventful days of bumps for the men’s first division, King’s M1 held position by rowing over, one of 14 rowovers in that division today. We knew that we were going to be up against it to get a bump on Clare, a crew who had produced some very encouraging results this term, however a strong last week of training gave us belief that we could hit them. We were starting on station 10, one of the worst starting positions on the river as we would be unable to pick a straight line to the corner off the start. This position did affect us, as in an effort to get as close to a straight line as possible led to Will being right on the end of the chain and unable to straighten the boat before the start. Nonetheless, we didn’t let the rudder affect us too badly off the start as we really ramped up the boat speed and started to gain on Clare. This was slightly unexpected as they had routinely left us for dead off the start in Lents. We continued to gain up the first half of first post reach as we moved towards our race rhythm. As we hit the rhythm, Clare started to extend the gap from just over a length out towards station again. Unfortunately, we had settled onto a slightly slower rhythm than was ideal, making things a little more difficult for ourselves. This, together with some fairly scrappy rowing and just clipping a barge on the inside of grassy meant that Clare were almost exactly on station ahead coming onto plough reach, with Christ’s sitting the same distance behind. This would have been the ideal opportunity to close the gap, but we couldn’t quite find the speed that we’ve had in training recently and so once out onto the reach, Clare opened up a little further as they chased the bump on Queens’ but thankfully behind us Christ’s never looked like seriously moving on us, putting in a huge push to get just within a length on the finish line. Overall it was not a disappointing day as we remained level but with so much improvement to be made, we are still looking good for the rest of the week. The mid-afternoon sun beats down through the clouds. A light breeze disrupts the surface of the water, sending the calm Cam into a tumultuous tapestry of colour – vaguely reminiscent of a Monet painting of Argenteuil. Having pushed out and rowed along to the P&E, we are left stranded on the bank due to the carnage in the division before us. We are powerless to do anything other than discuss tactics in the scorching sun, vaguely attempting to psyche out Clare Hall with tactics and Padge’s ‘jokes’. The final cannon blasts, the bung drops, the race is begun. A solid start sends the boat surging along the surface of the river. Boats, bikes, birds: all soon becomes a blur as we enter the first corners. Decent lines and good power bring us to the Plough, by which point Clare Hall in front had begun to pull away. The two pairs of boats behind have bumped out, leaving us a good amount of freedom once we reach the Reach. By this point, Clare Hall seem too far ahead to ever be bump. After taking some pressure off, though, Darwin come tearing round Ditton, seemingly going for a miraculous double-overbump. They fail, of course, wasting precious energy as they push on down the Reach. 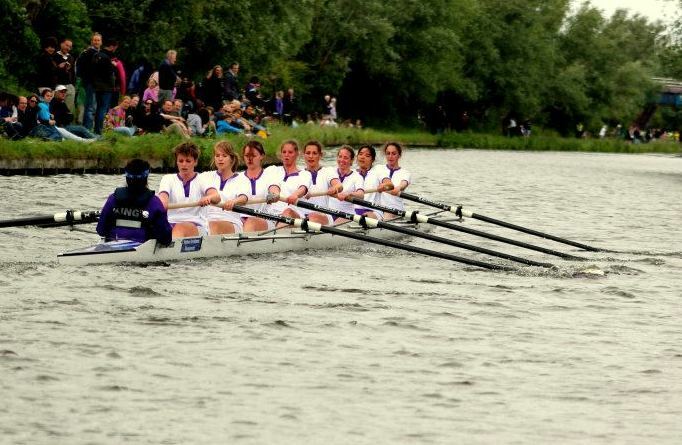 We persevere right through to the end, helped in part by some random women’s crews shouting from the bank. A relatively comfortable rowover takes us over the line. One race down, three to go. There was the customary last minute injury and frantic search for subs for this years w1. However undeterred and with our long suffering ex stroke back in her place we felt strong as we rowed up. Our practice starts felt tidy and more importantly fast. 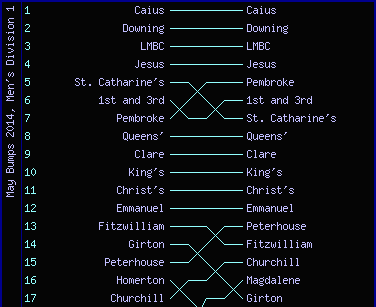 At the top of division two, we were focused solely on rowing over, with Magdalene w1 (an unknown quantity) chasing us. As the canon went of we were into the first corner almost immediately off our start. Then disaster struck as a steering error caused bow side blades to strike the side. We came to a halt, and this pause, though brief, allowed magdalene to close up a length on us. However we kept our heads and wound up over five and with some brave, impassioned rowing from bow and three around grassy corner we were holding them off. As we made our way onto the reach it dawned on us that Magdalene were slipping behind, this gave us the confidence to lengthen out and push in our finishes. Murray Edwards w1 were finally coming up onto magdalene and as they went in for the kill Magdalene launched a last ditch attack on us. However they never came close enough to bother us and once they had bumped out it allowed us to lengthen out and wind the rating down slightly to conserve energy for our next race. As for our second race it was a very different scenario. With nothing behind us, we were able to throw everything at Selwyn. But after a swift , clean start we realised the impact of having already raced once. After gaining a little on Selwyn, they started to disappear. Our rowing was beginning to get scrappy and short and this was our downfall as we eventually wound it down outside the plough. Overall though a good day of rowing. M3 went into the bumps race with a small amount of apprehension, considering that most of us had never rowed bumps before, and the only two that had, obtained spoons… However we didn’t let this phase us as we marshalled and rowed down to our starting position. The cannons went off and we got more and more nervous, but finally the start cannon boomed and we quickly set off as the well oiled machine that M3 is. Jesus were behind us but seemed to be drifting away, and we were keeping up with Sidney up to first post corner. And then, Sirens. Every boat had to hold it up. There had been a pile up at the back of the division which hadn’t affected us, but we had to turn around and go back to starting positions for a re-row after already rowing 600m. We were tired, used up all our energy stores the crew meal had given us the night before, it wasn’t a pleasant experience. 10 minutes later, the start cannon boomed again, and we set off. The start felt a bit more scrappy, Sidney pulled away from us as we went through all the corners, but Jesus were still behind us, and not falling behind as they had done in the previous race. As we went onto the reach, they were still at stations, and we looked comfortable for the painful row-over. But as we went down the long reach, disaster hit, a monumental crab from stroke left us all leaderless and completely out of time. We managed to recover after a few strokes but Jesus had gained a length on us, they were getting whistles. We pushed away and kept strong, but then another crab! Jesus were within 3/4 of a length and gaining. We pushed with all our might, but the rhythm never really got back together. We made it to the Railway Bridge before the whistles were continuous and the bump was confirmed. Dead, shattered and morally scarred, we rowed back to the boat house, vowing to take our vengeance in this life or the next. This year’s May Bumps run from Wednesday 11th June to Saturday 14th June. Support from everyone and anyone would be very much appreciated on every day of Bumps, but in particular KCBC will be hosting our annual marquee on First Post Corner from 11:30am on Saturday 14th June. Our team at the marquee will be supplying refreshments throughout the day (Strawberries and fizz will be available for a small fee), from 11:30am – 6:00pm. The marquee is free to attend, and you can reserve a car parking space by emailing Marijne Mak (parking spaces are available based on needs first, and then first come, first served). Division times for each crew can be found in the table below, but they may be subject to change and delay.